My 2010 horoscope promised to bring in a lot of positive changes in life. Who would have thought that the first one would come right on the 1st day of work? It has been a crazy week but for some reason I'm happily taking it one step at a time. Still, after coming home tired from running around all day, nothing beats the happiness upon seeing a box filled with pretty golden balls given by Paul's family. 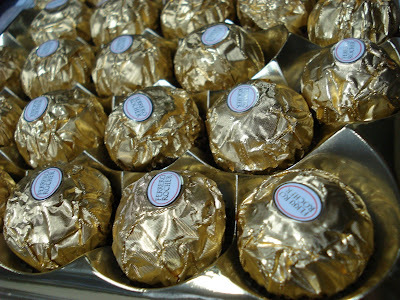 I love Ferrero Rocher and it has always been a treat indulging on a piece or two a day. Enjoying the nutty chocolate coating down to the thin wafer and finally allowing the thick chocolate melt in my mouth until I can slowly chew on the delicious hazelnut tucked inside spells heaven.